Today, transthoracic echocardiography (TTE) is widely used for evaluating the haemodynamic condition in the intensive care unit (ICU) and the operating theatre [1–4]. 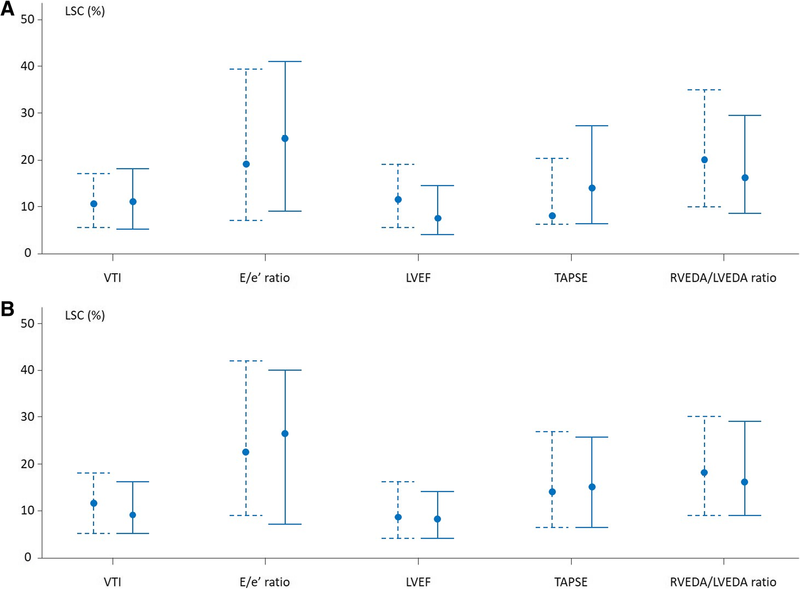 In particular, in critically ill patients, TTE is daily used to track changes in cardiac output, which are assessed from relative changes in the velocity-time integral (VTI) of the left ventricular outflow tract. Especially, TTE is used for assessing the effects on cardiac output of some therapeutic interventions (fluid administration, inotrope infusion) [5–10] or for performing tests assessing preload responsiveness like the end-expiratory and inspiratory occlusion tests [11, 12], passive leg raising [7, 9, 13–15] or a mini-fluid challenge . All echocardiographic measurements were performed with a Philips CX 50 (Philips Healthcare, DA Best, The Netherlands) by four different board-certified operators (MJ, PM, JG, FD) at end-expiration and according to current recommendations [18–20]. At a second step, from the CV obtained in the experimental population, we inferred the coefficient of error (CE) for each variable as CE = CV/√n, where n is the number of replicates that the TTE examination performer would choose to average in theory within one TTE examination. The precision was calculated as being 2 CE [21–23]. The lower the value of the calculated precision, the closer the measurements to each other, and the more precise the technique . It is usually considered that a precision level < 10% is desirable . The intra-examination LSC was calculated using the following equation: LSC = CE × 1.96 × √2 [21, 22, 24]. This corresponds to the minimal change observed during an examination that can be considered as real and not related to the variability of the measurement. In practice, at a first step, the SD was obtained from the results of the two examinations. 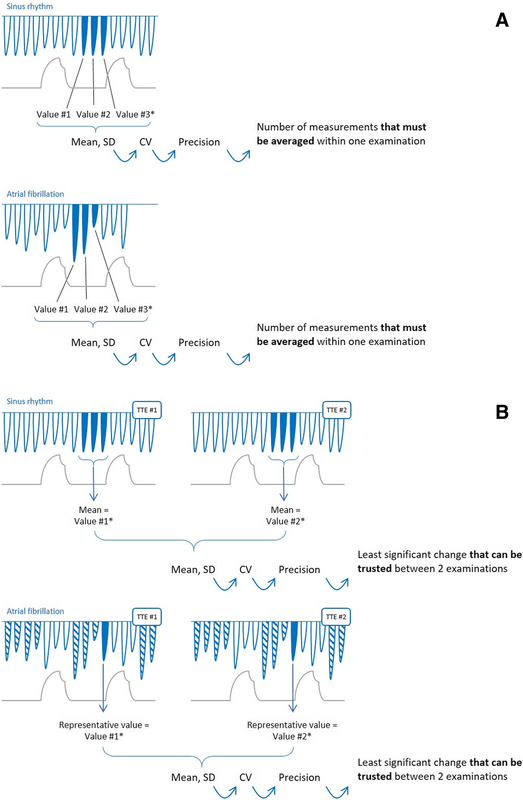 This result was the average of three consecutive end-expiratory measurements performed within one examination in patients in sinus rhythm [18, 19, 25–27] or a single end-expiratory measurement visually estimated as the average of ten consecutive end-expiratory ones performed within one examination in patients with atrial fibrillation [28, 29]. The corresponding coefficient of variation (CV) was calculated as CV = SD/mean of the two measurements, each being performed in one TTE  (Fig. 1b). The inter-examination LSC is even more interesting to consider because it regards the several instances when one assesses changes in echocardiography variables during two different examinations, by different operators or by the same operator, but after replacing the probe on the thorax. In particular, a positive response to fluid is often defined by an increase in VTI ≥ 15% [5–10]. This threshold seems reasonable in most patients when measurements are performed by the same operator (VTI LSC 11 [5–18]%), but obviously to small if performed by different ones. This is also the case for the passive leg raising test [7, 9, 13–15] or the 100-mL fluid challenge , the positivity of which is defined by an increase in VTI ≥ 10%, even though this threshold is very close to the VTI LSC for examinations performed by the same operator. By contrast, the VTI LSC is larger than the diagnostic threshold of VTI changes found for fluid challenges smaller than 100 mL , or for the end-expiratory occlusion test [11, 31, 33]. In such instances, changes in VTI must be assessed by the same operator, without moving the probe during the whole duration of the test. Regarding the number of measurements to average within one examination, we found that, within one examination in patients in sinus rhythm, the precision was acceptable for almost all variables if measurements were averaged over three cardiac cycles, the median and the highest value of the interquartile range being < 10% [16, 22]. This agrees with the most recent cardiology recommendations [18, 19, 25–27]. Interestingly, the variables with the worst precision were LVEF and the E/e’ ratio, which precision itself depends on the precision of the measurements used for calculating them. 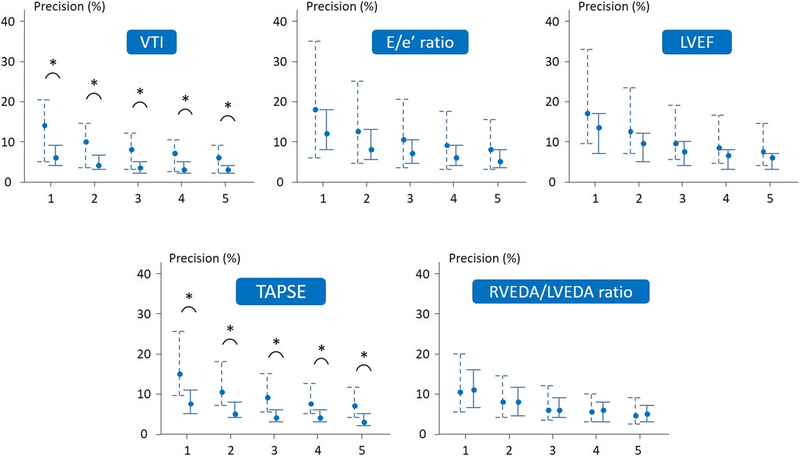 Importantly, in order to minimise the intervention of respiratory variations in measurements during experimental data acquisition, we performed measurements at end-expiration. In this regard, the preload status of the patients should not significantly interfere with our results. The values of precision and LSC we provide are thus valid only in a similar condition.